High-performance, durable and a leader in the industry: the Trackman XP rubber crawler track from Continental. Continental has been awarded with a total of eight prizes on the occasion of the German Innovation Award. One of its products, the Trackman XP rubber crawler track, caught the attention of the panel with its innovative properties and user benefits, and received an award. Vehicle interior solutions were the recipients of three awards. Alongside the 3D Touch Surface Display and the two-finger touch gestures, Intelligent Glass Control, which darkens the vehicle glazing, also received an award. Four awards went to pioneering surface materials: one for the breathable upholstery material laif VyP, one for the skai digital printing collection for individual designs, one for the skai TransPorter collection used on vehicle floors, and one for the environmentally friendly Flightfloor Eco, which is specially designed for aircraft floors. The German Design Council presented the awards on June 6 in Berlin. The Trackman XP has innovative properties. Special anti-vibration technology combined with optimized tread design reduces vibrations by as much as 70 percent compared with conventional tracks, therefore enhancing ride comfort – particularly for applications with a high tractive force. Special additional technological properties result in a longer overall service life. Armorlug technology makes the tracks last up to 23 percent longer than comparable lugs, for example. “The award is testament to the fact that we are setting new benchmarks for the market with the Trackman XP,” notes Dr. Michael Hofmann, who is globally responsible for the industrial conveyor belt business – and therefore also for the Trackman product range. 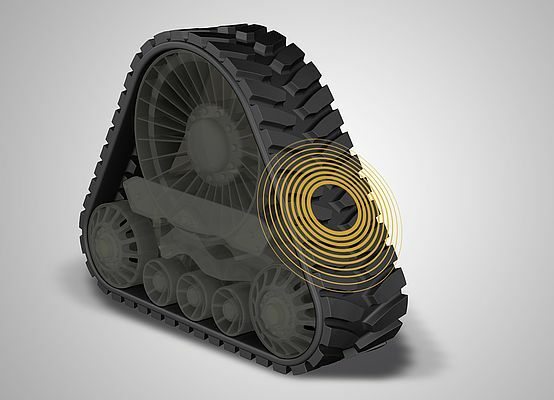 Rubber crawler tracks with integrated sensor technology also feature among the company’s future technological innovations. This technology measures and monitors the temperature of the carcass when the vehicle is in operation. Targeted monitoring helps operators of agricultural vehicles, for example, to improve the service life and efficiency of the components and to avoid breakdown costs.